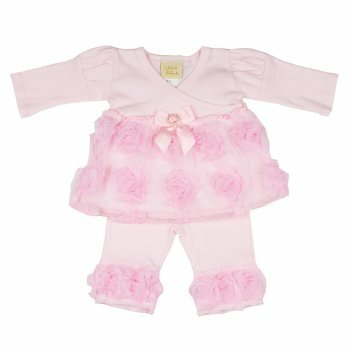 She'll be "Pretty in Pink" in this Haute Baby "Emma Rose" 2 pc. Legging set from their Signature Collection. A great outfit for any occasion. 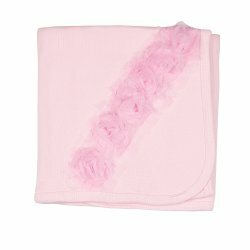 The top features a bodice with criss cross neckline, for easy dressing, that has two rows of soft pink tulle accented with pink chiffon roses that go all the way around. A sweet satin pink bow with sparkling jeweled center adds a touch of bling at the center. Pull up pants in pink, just like the top, are 100% cotton so it's nice and soft against baby's skin. 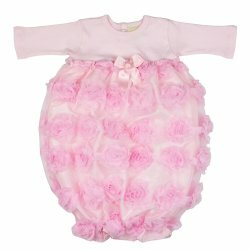 Hems are accented with the same pink roses as the top which beautifully pulls the outfit together. Consider adding the headband to complete her look. A sweet, and precious outfit - after all - a girl can't have enough pink in her wardrobe, right? So cute! 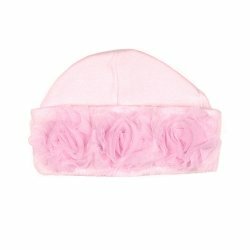 Size: Select One 3-6 mos. 6-9 mos. 12 mos. 18 mos.